We extend the results about the vanishing topology of isolated Cohen–Macaulay codimension 2 singularities from a previous article by Frühbis-Krüger and Zach (On the vanishing topology of isolated Cohen–Macaulay codimension 2 singularities. arXiv:1501.01915, 2015). Due to the Hilbert–Burch theorem, these singularities have a canonical determinantal structure and a well behaved deformation theory, which, in particular, yields a unique Milnor fiber. Studying the case of possibly non-isolated singularities in the Tjurina transform, as introduced in Frühbis-Krüger and Zach (2015), we reveal that in dimension 3 and 2 there is always exactly one special vanishing cycle in degree 2 closely related to the determinantal structure of the singularity. 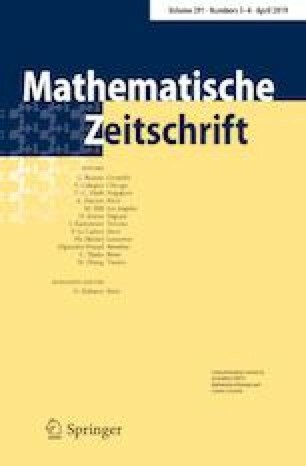 The author wishes to thank A. Frühbis-Krüger for guidance and support, M. Tibăr for discussions during a visit in Hannover and the organization of the workshop on nonisolated singularities in Lille and D. Siersma for further discussions on the topic. Furthermore, he thanks M.A.S. Ruas and the ICMC for hospitality and a stimulating mathematical framework during a stay at the USP in São Carlos. Thanks also for conversations with T. Gaffney and M.A.S. Ruas on determinantal singularities, which significantly broadened the viewpoint of this paper. During the preparation of this article, the author was funded by the DFG program GRK 1463 and the DAAD program IP@Leibniz at the Leibniz Universität Hannover.